So there we were Memorial weekend, a small but dedicated foodie crowd of eight sitting down to a feast of Korean barbequed pork, Thai seafood salad, grilled eggplant, potato salad, blueberry-almond tartlets, all washed down with sangria. Just to get one more nation represented, we’d started the afternoon with a spread that I call Greek Platter (elsewhere on this very same website), which we nibbled while sipping our sangrias on the porch in the amber afternoon sun. Did I mention the potato salad? Because that eclipsed the meal. If we’d put out nothing but sangria and the potato salad, I dare say we’d have had just as happy guests as we did with the rest of the spread out there. 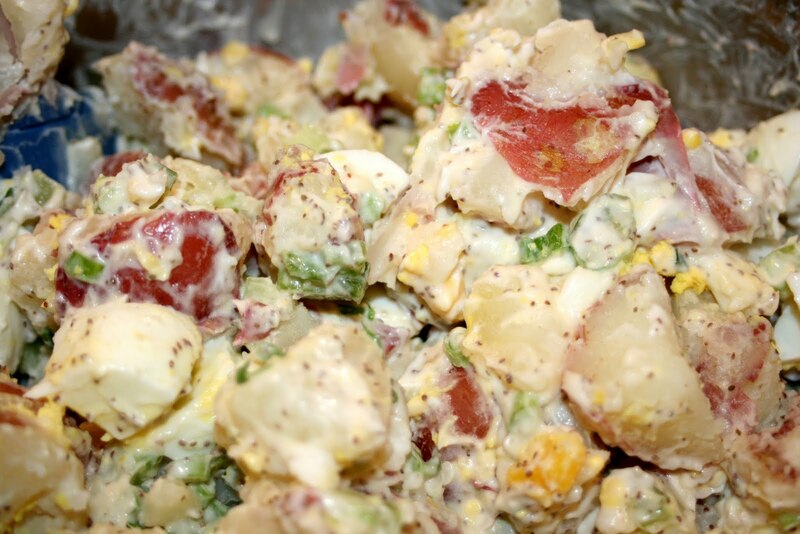 You’ll get no argument from me – this is killer potato salad. I was off on a search for the recipe after sampling the potato salad from our very own VA-grown BBQ chainlet Red, Hot and Blue. They produce an excellent potato salad, but now that I made my own version of their recipe, I’d say it’s even better when you make it yourself. Do yourselves all a favor and don’t bother cooking for your next cookout. Just throw together this gem of a recipe – just five ingredients – slap some burgers on the grill and you’ll be viewed as an icon of culinary brilliance by all who dine that day. Wash potatoes and prick all over with a fork; place them in a plastic bag, leaving it open at one end. Put the bagged potatoes in the microwave and microwave on high, checking them after six minutes. Potatoes should be easily pierced by a fork. If they are not cooked, continue microwaving another two to three minutes. Let them cool before removing from the bag. Meantime, hard boil the eggs, plunge into ice water when done. Peel eggs and chop roughly. Put them in a large mixing bowl. Add scallions and celery seed. Once the potatoes have cooled sufficiently, dice them into a large dice and add to the egg and scallion mixture. Add mayonnaise and gently toss so all the ingredients are well mixed. Taste for salt (I usually add a dash or ¼ t). This entry was posted in Recipes from Adrienne's pantry, Salads, Sides, Vegetarian and tagged eggs, potato, potatoes, scallions, vegetarian. Bookmark the permalink.